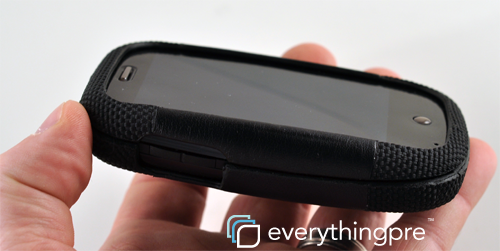 The Body Glove case for Palm Pre is yet another two piece snap on case. This one comes from the familiar Body Glove brand and features a faux nylon material. The sliding mechanism of the Pre requires any form fit case to require customers to snap two parts on the Pre to form a single case that protects your phone. The Body Glove Faux Nylon case is no different and actually came with directions on how to properly snap the pieces into place. With a certain amount of manuevering, I was able to get both pieces snapped into place. The end result was a case that fit perfectly. Once installed, I really enjoyed the overall feel of the case. It feels great in the hand and does not add unnecessary bulk to the Palm Pre. 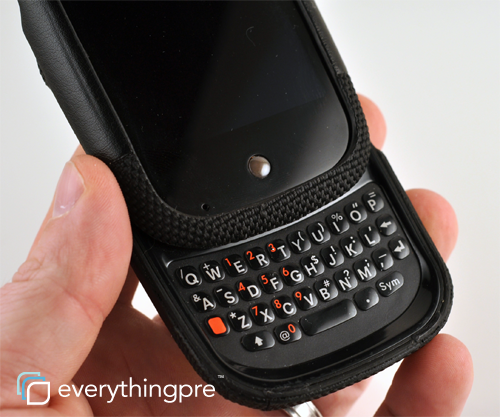 The textured faux nylon provides a grip not found with the slip sliding away gloss of the standard Palm Pre backing. The position where I normally slide my Pre is actually a faux leather that feels nice to the touch. There’s lots of faux surrounding this case, but good materials either way. It’s also very solid and durable. This will protect your Palm Pre and the case itself will still look good after usage. The Body Glove case is not compatible with the Palm Touchstone. If you own a Touchstone, I’d recommend you look at the Seidio InnoCase. You won’t be able to use the case with the Touchstone backplate either. The Body Glove case provides access to all the necessary ports. I found the gaps to provide sufficient enough space to access them without bumping into the case. Typing overall was not an issue, although I did find myself slighting bumping up against the bottom part of the case when typing letters in the middle of the keyboard. Not overly problematic, but worth noting. The Body Glove Faux Nylon case offers excellent protection, feels great in your hand and the durability to keep your case looking like-new. The lack of Touchstone support will likely rule this case out for many of you. If you are not in the Touchstone camp, this case has plenty of positives and certainly a case we’d be happy recommending. 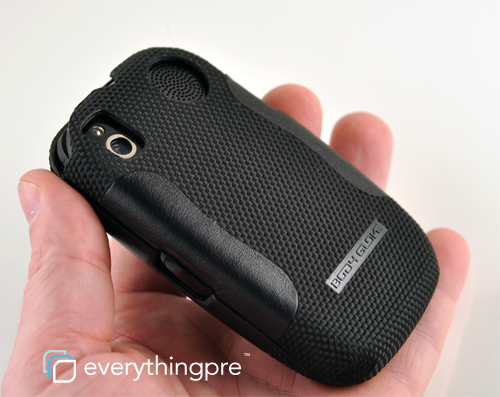 The Body Glove Faux Nylon Case for Palm Pre retails for $29.99 and is available in the Everything Pre Store. I had this case for a few months now. The first body glove case I ordered had to be sent back because the top piece didn’t snap on correctly and kept falling off. The second one I still use but it also never snaped on all four corners correctly. After a few weeks of use only the upper right hand corner snaps on. If I drop it or pull it out of my pocket to quick the top piece comes off. Very annoying but it does protect my phone. It makes my phone look cool but for 30 bucks I wouldn’t recommend it, just cause I couldn’t guarantee it would snap on correctly. I had the same issue when the Touchstone backplate was on the Pre. When I switched to the standard backplate, the fit was pretty solid. If there is any give, it seems the top, right back is probably most prone to coming loose. For fit, I still say the Seidio InnoCase trumps all, at least the cases I’ve tested. Case is good for three months max, then like the other reviews stated, it breaks. Don’t waste your $30 on this.